Your stories. Your fears. Your triumphs. Your failures. There is a movement afoot… a movement that celebrates the power of everyday lives, and which proclaims that the memories we hold within our hearts are the most powerful stories we can tell. You can see it alive in projects like PostSecret, Mortified, Found Magazine, StoryCorps, and This American Life, all of which take our lives and reflect them back to us respectfully, humorously, and sincerely. That is where Austin Secrets takes its motivation. 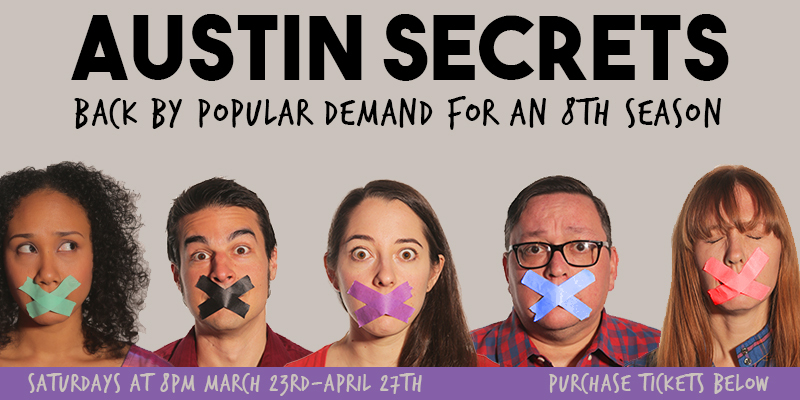 In every show we’ll use improvisation to explore secrets anonymously submitted by you and other Austinites. Serious secrets will be treated with proper respect, and more lighthearted secrets will be treated frivolously, so expect a mix of drama, comedy, and everything in between. I’ve been trying to figure out what about this show in particular allows that kind of energy, and I think I’ve figured it out: Subtext. All good theatre–good fiction in general–has subtext. The meaning under and behind the literal dialog that characters say tell the real story. We need your secrets for the show! Share anything at all, so long as it is something you’ve never told anyone at all.